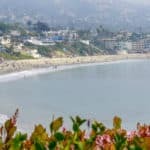 Avila Beach just off Highway 1 on California’s central coast is a road that takes you through a lush oak valley lined with transformative spas featuring natural, mineral hot springs, world-class massage, yoga instruction, and sense therapies. Visit Avila Beach with its clean white sand beaches, ideal climate and warm ambiance. This sets this seaside village apart from all others. You’ll find oceanfront resorts and family friendly vacation rentals. You can enjoy several local wine tasting rooms in town and in the Avila Valley, as well as the natural mineral spas which are open all year round. In the Fall, you can tour the apple orchards for the best of the season’s harvest. It’s hard to imagine yourself anywhere else but on the beach in Avila. Experience this hidden paradise on the Central Coast, with one road in and one road out. Avila Beach is a breath of fresh salt air, with amenity-laden hotels, charming oceanfront restaurants, magnificent local wines, and shopping and activities for all to enjoy. Start planning your next vacation, and plan on being enchanted, in unforgettable Avila Beach. Visit Avila Beach! Avila Beach has two distinct seasons; dry summers and cool, foggy, rainy winters. There is very little fluctuation in the overall temperature of the year. If going to the beach is your purpose, then summer is the best time to visit Avila Beach. Otherwise any time of year is great to visit Avila Beach. From May – October, the temperature stays from 60s to low 80s Fahrenheit. You will not see a lot of rainfall during this time. So, for beach lovers, summer is perfect to lie down on the sand and enjoy the serene view of the sea. Summer is also peak season for Avila Beach, and lots of activities are held on the beach. During November – April, the temperature stays in the 40s to low 70s Fahrenheit. Rainfall is common during this time. So, expect wet and foggy winter. Rainfall might hamper your plan to explore the beach. But if you want to avoid the tourist crowd, then winter is perfect for you. Avila Beach is definitely a year-round beach destination. This place is a hidden gem. 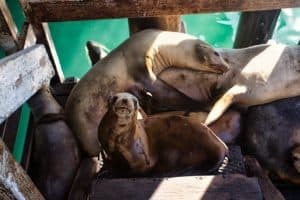 On the end of the Port of San Luis Pier, there is a small set of stairs where you can get up close and personal with a lot of sea lions. Please heed the warnings and don’t get too close to them, s they can bite. Parking is at the end of the pier. After parking, look for a small set of stairs off to the right. You will see a sign for the rules about seeing the sea lions. Just go thru the gate and you will be up close with them. You can walk all the way to the bottom of the stairs, and you will find many sea lions. Here is a great YouTube video of getting up close with the sea lions. Point San Luis Lighthouse is a fully restored national landmark with tours open to the public Wednesdays (12 & 1pm) & Saturdays 12, 1, & 2). The site offers private group tours, educational trips for schools, special events, and weddings. Tickets for the tours can be purchased online at the Point San Luis Lighthouse website. For more information visit them on the web at Point San Luis Lighthouse. The mission of the Central Coast Aquarium is to cultivate a community that is dedicated to ocean stewardship through education, engagement, and action. The aquarium hosts school groups and provides marine science education programs to students ranging from preschool to high school. The aquarium is also open to the public during the school year on Friday from 12-4pm and on Saturday and Sunday from 10am – 4pm. All admission and proceeds go towards funding marine science education programs for local students. For more information visit them on the web at Central Coast Aquarium. Kick back, and beat the heat relaxing in the shade of the palm trees and ocean breezes. 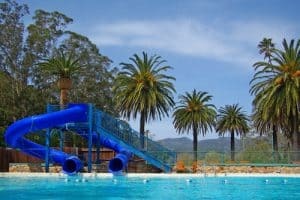 Enjoy all the funky fun and convenience Avila Hot Springs is known for, including group picnic and BBQ facilities, heated freshwater pool with double slides, hot mineral soaking pool, massage therapy, and Wally’s Bike Rentals with access to bike trails. For information visit them on the web at Avila Hot Springs. Overlook the waters of one of our nation’s most spectacular marine protected areas, offering some of the best wildlife viewing in the world! Whale Trail signs can be found at the following Highway 1 Discovery Route spots: San Simeon, Cambria, Cayucos, Los Osos, Avila Beach, & Oceano. The 6 sites in Coastal San Luis Obispo County represent the largest cluster of sites on the Pacific Coast. For more information visit them on the web at The Whale Trail. Experience ‘The Water’ and nurture your skin, body, heart, and soul. The naturally heated mineral spring water at Sycamore is sourced from over 100 acres of natural, underground resources. 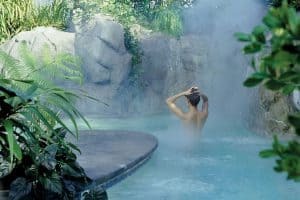 When you slip into one of our hot tubs or the remarkable Waterfall Lagoon, you immediately feel the water’s soothing features. 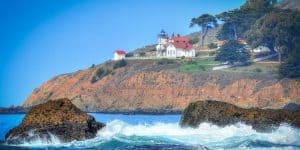 Kayak and paddleboard to a private beach and walk up to the historic Point San Luis Lighthouse! Located directly on the waterfront. Rentals, lessons, and adventure tours. 2016 & 2017 Voted best of SLO county! . Explore the pristine waters, natural coastline, and secret beaches of Avila, the hidden gem of San Luis Obispo County, with Avila Beach Paddlesports. For more information call 805-704-6902, or visit them on the web at Avila Beach Paddlesports. 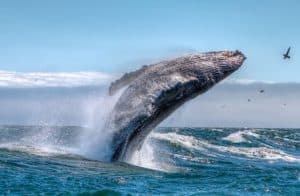 They have fantastic whale watching and wonderful weather year round. All of their boat tours are family friendly and appropriate for all ages from infants to great grand parents. 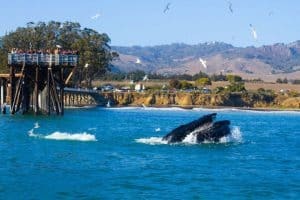 Experience an abundance of wildlife viewing opportunities on every tour and see for yourself why locals and visitors alike consider these tours their favorite way to share the beauty of the Central Coast with friends and family. For more information call 805-540-4667, or visit them on the web at Central Coast Sailing Charters. Ocean rafting whale watching! Military RAIV (Rigid Aluminum Inflatable Vessels) are known for their speed, safety and stability. With owner/operator Micheal Brink as your Captain, you will get nothing but the best of Whale Watching and Adventure. This is a 2 hour tour with 5 people max. Private charters are also available. 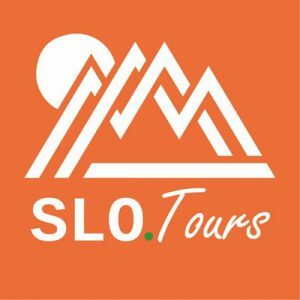 For more information call 805-705-8681, or visit them online at SLO Tours. This Central Coast beach-side location holds beautiful views with a casual atmosphere. Your dining experience is always their number one priority. The menu has something for everyone… fresh fish, hand cut steaks, refreshing salads, burgers & sandwiches, nachos, and plenty specialty appetizers. They offer many different items and serve breakfast, lunch and dinner. Have a drink at the cocktail bar, or dine on big outdoor (heated) patio while gazing out across the beautiful San Luis Bay. For more information call 805-595-7555, or visit them on the web at Custom House. Awarded ‘The Most Romantic Restaurant in San Luis Obispo’, The Gardens of Avila at Sycamore Mineral Springs Resort offers an intimate setting with a cozy fireside lounge, elegant dining room, and a century-old stone patio. Executive Chef Robert Trester invites you to entice all of your senses by savoring the flavors of their seasonally fresh menu while enjoying your beautifully prepared meal in the breathtaking garden surrounding. For more information call 805-595-7365, or visit them on the web at Gardens of Avila. The Olde Port Inn offers a unique feel that stands out among Pismo Beach Restaurants and other Central Coast Restaurants. Enjoy fine dining over the ocean at the Olde Port Inn on the Port San Luis pier, the best seafood restaurant on the Central Coast of California. A wonderful ocean setting on the pier makes the Olde Port Inn the place to be for a superlative dining experience on the Central Coast. For more information call 805-595-2515, or visit them on the web at Olde Port Inn. Ocean Grill features the freshest seafood, local produce, and steaks grilled to perfection by Chef julie Simon from Thomas Hill Organics in Paso Robles, and Chef Spencer Johnston from Full Of Life Flatbreads in Los Alamos and Granada in SLO. Ocean Grill offers 180 degree views of the bay, an LED backlit onyx bar top, and 500 bottle wine bottle display! For more information call 805-595-4050, or visit them on the web at Ocean Grill. Fat Cats Cafe is one of the most charming cafes or restaurants you will ever visit! This rustic diamond has been attracting not only locals but a variety of California visitors and travelers from all over for over a quarter of a century. It has a reputation for its Ocean views and great service are the reasons customers come to Fat Cats but award winning meals are the reason they return. For more information call 805-595-2204, or visit them on the web at Fat Cats Cafe. 2nd Chance Winery is one of the newest tasting rooms in Avila. It’s located in the new Landing building on the downtown Avila promenade. Their experience from their other winery Cottonwood Canyon in Santa Maria makes this place is a welcomed treat with plenty of great wines for purchase. For more information call 805-595-9500, or visit them on the web at 2nd Chance Winery. PierFront Wine & Brew opened in October 2014 and is located right on the ocean in Avila Beach. Come by and enjoy a glass of their very own PierFront wine, local wines, wines from around the world, and brews. They also offer a variety of delicious appetizers. For more information call 805-439-3400, or visit them on the web at PierFront Wine & Brew. Morovino celebrates the everyday appreciation of fine wines. At Morovino, owners David and Andrea Bradford delight in sharing their knowledge of food, wine and winemaking. They believe that wine should be approachable. Located in Avila Beach, just a block from the ocean, Morovino embraces the Italian winemaking philosophy of: Wine ! Food! Fun! Family! For more information call 805-627-1443, or visit them on the web at Morovino Winery. Bikinis, beer and the beach. Sound like paradise? Well it is, and it’s happening at Mr. Rick’s in Avila Beach! Equipped with pool tables, a large beach front patio, and a hot, young energetic staff, Mr. Rick’s caters to anyone looking to have a good time. After a long day on the beach and the sun goes down, put on your dancing shoes and let the best local bands and hottest DJs entertain you all night long. For more information call 805-595-RICK, or visit them on the web at Mr. Rick’s. 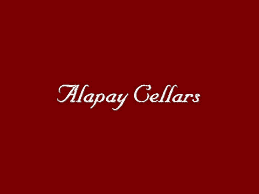 Established over a decade ago, Alapay Cellars has an uncompromising philosophy of producing high-quality and hand-crafted French oak barrel aged wines. Visit the fun, relaxed, and cozy tasting room atmosphere. They are wine tasting with an attitude! For more information call 805-595-2632, or visit them on the web at Alapay Cellars. When you first enter the beautiful lobby of the Avila La Fonda Hotel, you will experience a sense of Old World Mexican hospitality. From the beautiful solid wood doors that enter onto traditional Saltillo tile, honored by a massive rock fireplace, enriched with warm colors and hand painted artwork, your senses will immediately relax. This intimate boutique hideaway, with all the luxuries of a family home, and staff that treat you like a dear friend, is ready to pamper you while you enjoy waves, wineries, golf, restaurants and the quaint town of Avila Beach. For more information, pricing, or to reserve your room, visit the Avila La Fonda Hotel. Avila Village Inn is an upscale boutique hotel nestled in the charming Avila Valley just off Highway 101, and only minutes from beautiful beaches, incredible golf, fine dining establishments, and more. While staying with them, you’ll enjoy easy access to explore all the beautiful natural surroundings, including the Bob Jones City-to-Sea Trail right next to the hotel. They’ll even provide you with complimentary bikes to ride the trail. The Avila Beach hotel is the perfect destination for romantic weekends, anniversaries, or golf and spa vacations, with charming craftsman-style architecture that provides a serene, relaxing setting for your stay on the Central Coast. The inn features 30 comfortable and spacious rooms, and a wealth of generous amenities like free Wi-Fi, complimentary wine tasting coupons and recreational activities. For more information, pricing, or to reserve your room, visit the Avila Village Inn. Located in Avila Beach, 6 miles from Pismo Beach, Inn At Avila Beach features a grill and sun terrace. Guests can enjoy the on-site restaurant. Free WiFi is provided throughout the property and free private parking is available on site. Certain units feature a private bathroom with a spa bath, and others have bathrobes and free toiletries. There is free shuttle service at the property. This hotel has water sports facilities and free use of bicycles is available. For more information, pricing, or to reserve your room, visit the Inn at Avila Beach. Situated along California’s stunning Central Coast half way between San Francisco and Los Angeles, Avila Lighthouse Suites is located steps away from the sand and surf of the beautiful Pacific Ocean in Avila Beach. Soak up the laid-back Avila Beach vibe on the sand or in town, where shopping and dining are steps away. Every suite offers a kitchenette, private patio or balcony and deluxe in-room amenities, complimentary daily breakfast & free Wi-Fi, oceanfront heated pool and spa, and a on-site spa offering massages, facials, and body treatments. For more information, pricing, or to reserve your room, visit Avila Lighthouse Suites. This property is a 10-minute walk from the beach. Overlooking the Pacific Ocean, this Avila Beach hotel features an outdoor pool. The hotel is located across from the beach and the spacious studios provide full kitchen facilities. A private balcony is offered in every studio at San Luis Bay Inn. Decorated in natural colors, the studios offer a spacious dining and living area. Cable TV is included. An outdoor hot tub is available at the hotel. Tennis courts and laundry facilities are also on site. For more information, pricing, or to reserve your room, visit San Luis Bay Inn by Wyndham Vacations. I have visited Avila Beach several times. I love the sea lions by the pier. I even fed a pelican fish! I have also stayed at the hot springs–the smell of sulphur was a bit strong for my liking. But it’s a great place to visit. Oh, I have not ventured to feed the pelicans! They just seem like they would snap at the food, similar to my dog LOL. You know, that is a great visit…the sea lions by the pier. I think I will add that as something that should be done while in Avila Beach. Thanks for reading Sandra! Yes Shantaye, I think that I would get bored just lounging at the beach everyday. Granted there are water sports and beach side games, but I like to explore as well. Glad you enjoyed Avila Beach! Thanks Goran and I am glad you enjoyed visiting Beach Travel Destinations. I hope you joined my newsletter, as I will be sending out some great deals! When my wife and I get started on our RV tour of the US, we will make this a destination. Avila beach is inviting and my wife will love the mineral springs. This being just off Highway 1 makes it easy to get to and visit. The inviting beaches will be a must for us as we love the beach. 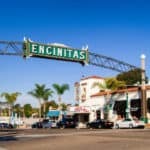 This looks to be a more affordable destination in California making it a great place to spend some time. It is an affordable place, and your wife will love the mineral springs. Thanks for reading and glad you have decided to stop and visit Avila Beach! Nice webpage on Avila Beach. The mineral springs are the first places I would visit followed by the aquarium and whale watching. Plenty of things to do which makes Avila Beach a good beach destination. Nice hotels and restaurants too. You have a good video of the beach. Great aerial view. Thank you Mick, and yes it is a great beach destination. Thanks for visiting Avila beach! I’m a So-Cal resident myself and haven’t heard of this spot before. 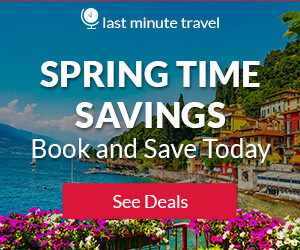 Your page is full of info to not only convince me but help me plan my whole trip. I definitely will journey to this beautiful spot soon! Yes, you are so close Greg! I can’t believe that you have not heard of this great coastal community. Hopefully you can visit Avila Beach soon 🙂 Thanks for reading! A beach that does not get too hot. I like the idea of the electric bike rentals. Have seen several around the area that I live and the people do not have to work so hard to get around. I like the idea of the whale watching, hot springs and wine tasting for down time. May spend more time with this than the bike. It is all good and fun! I have to agree with you, hot springs and wine tasting….nice. Electric bikes are popular here, and I think, man they are not having to do much work. And for a vacation, great! Thanks for visiting Avila Beach. This sounds like the ideal place for me! I have always wanted to go to California. My husband and I want to go there for our honeymoon actually… have you vacationed here yourself? Great info! Thanks for providing info on when to go too. That is very helpful and the most hardest part of traveling I think. Yes, Darcy I have vacationed here and you cannot go wrong with this whole area. There is so much to do. You can do as little as you want, or stay as busy as you want. Wonderful and beautiful! Thanks for visiting Jayde and you are most welcome. You can’t go wrong with this whole area. It is all so beautiful with so many things to do and see. Thanks for stopping by. Visit Avila beach and make sure to see the sycamore mineral springs. That sounds like the most interesting part of the trip. I wonder if the lighthouse used to have more to it. Seems like it’s a bit inland for a functional one. Maybe just looks smaller in the picture then I am imagining a lighthouse to look like? No, I think you are right Eric. I am not sure, actually, on the history of the lighthouse. Seems like it is not substantial enough to have been used as a true fully functional lighthouse. I must look this up! And no, it is not any bigger in real life. I agree, the mineral springs would be my first place to visit. 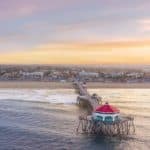 I had honestly never considered checking out beaches in central California, but your post definitely has me intrigued! Thanks for sharing this information! I think the beaches here are some of the best in California, hands down. There are quite a few to choose from and the coastal communities are wonderful with so many things to see and do. Thanks for visiting! Oh my! You have me sold! I had no idea that there were beaches like this on the Central Coast! The bay is beautiful and calm. I would also love to check out the Aquarium and Mineral Springs. One day we will stay at Avilla Village Inn and bike the Bob Jones City-to-Sea Trail to take in the sunset. Thank you for all of the fantastic recommendations! This is great! I lived in Southern California forever and would definitely had made the trip up had I known how much there was to do there! Fabulous information and recommendations! Thanks Karissa! Yes, the whole area is wonderful with so many things to see and do. Personally a favorite of mine for sure. You will have to head back and visit Avila Beach!